Computer users often have small secrets that they need to store securely. For example, most people manage numerous online accounts. Remembering a complex, unique password for each is impossible, but writing them down is both insecure and tedious. Users typically respond to this situation by recycling simple passwords across many accounts, which is also insecure. The keychain is not limited to passwords, as shown in Figure 1. You can store other secrets that the user explicitly cares about, such as credit card information or even short notes. You can also store items that the user needs but may not be aware of. 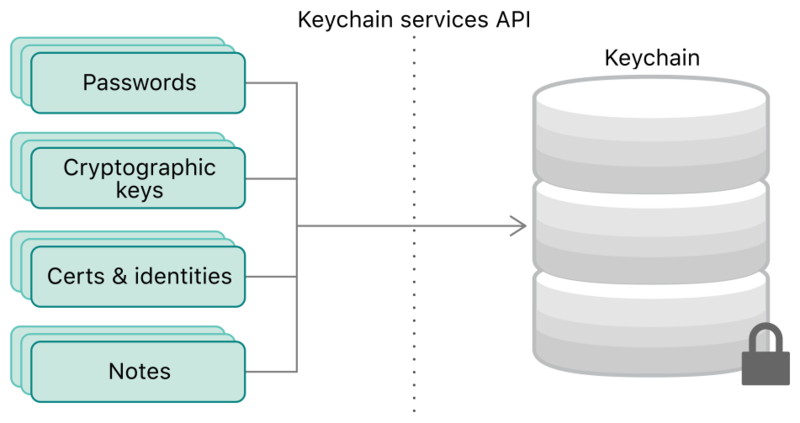 For example, the cryptographic keys and certificates that you manage with Certificate, Key, and Trust Services enable the user to engage in secure communications and to establish trust with other users and devices. You use the keychain to store these items as well. The identifiers for the keychain groups that the app may share items with.